Many may think skylight is in bad shape and needs to be replaced but it may only leak because of the ice dams that are allowing water to enter around the skylight and cause a leak.It’s like taking a shower with hot water and getting all the mirrors moist. As soon as you turn on the fan all the moist air fans out and circulates the air. Due to position of the skylight, snow does melt and freeze. Monitor skylight tunnel for yellow stains to make the call. So on your roof there are vents designed to fan out the trapped moist air. If these vents are blocked because of the snow or they are not big enough to fan out the moist air, it will cause condensation. If you are experiencing similar effects and want some answers, contact your Ottawa Roofing Contractor for advise. If roof vents are not visible and covered with snow, hire an experienced roofer in Ottawa to remove all the snow off your roof. Winter in Ottawa has gotten more severe in the past few years. Sudden thaw and freeze has been causing freezing rain accumulation over the years. As a homeowner it is that time of year to take a good look around your house and make sure there isn’t any massive icicles hanging around. It can be really dangerous depending on where it is located. If the ice dam/icicle is located above any doorway, steps or parked cars etc… contact a local roofing company to have it removed safely. If you notice any stains on the ceiling or would like to have all the snow and ice removed off your roof as a preventive measure, please give us a call or send us an email. We offer free roof snow/ice removal quotes and estimates in Ottawa. Residential, commercial and industrial roofing and snow removal services. I have to admit this past week was extremely crazy. My phone did not stop ringing for the past 5 days because of all the houses that got flooded because of the ice dams. Homeowners starting to understand the importance of a good quality roof instead of a quick fixer upper. The money they saved on the roof replacement plus few more thousands to the repairs to correct the issues and maybe a new roof. Ice dams does not form on its own. 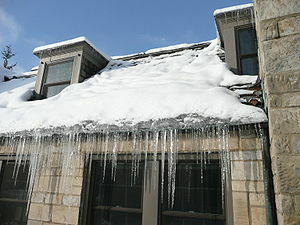 It requires either direct sunlight or heat loss thru your attic to form ice dams. Proper ventilation is one of the issues. When the vents get covered by snow, it makes it harder to vent our or even does not vent out at all. When the hot air gets trapped in your attic if will push back thru the ventilated soffit and start to form ice dams along the gutters. Hot fumes will melt the snow and turn it into ice over night. Eventually it gets bigger and wider. Whenever there is a warmer day, snow melts and it polls up behind the ice dam. It wont take a long time until you can see it dripping from your ceiling. Here is my advise to the homeowners, don’t try to save couple of hundred dollars during replacing your roof. Make sure drip-edge is installed along all the edges. Depending on the slope of your roof have ice and water shield installed at least 6 feet from the gutters maybe more if needed. And have the rest of the roof covered with felt/tar paper or anything similar. When we replace a roof our minimum usage of ice and water shield is 6 feet. Regardless of what the slope is, it is our company policy install 6 feet of ice and water shield and 100% felt paper and of course maximum ventilation. We offer residential and commercial pitched/flat roofing and repair, siding repair, foundation repair, snow plowing, roof snow removal and roof ice removal services in the cities of Ottawa, Nepean, Barrhaven, Kanata, Stittsville, Manotick, Greely, Gloucester, Orleans, Cumberland and Rockcliffe Ontario.